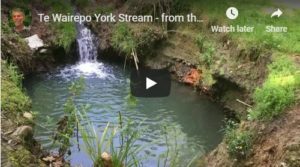 Follow the clean-up process that has been happening in the Te Wairepo York Stream running through central Nelson. Starting high in the hills near the York Valley landfill and running slowly down to where the Saltwater Creek joins the sea, the waterway is starting to show promising signs of rejuvenation. This progress was filmed over 2 years by Warren Hoy.